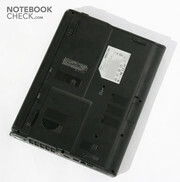 The MSI Megabook PR211 is situated both physically and pricewise just above the most expensive Netbooks. With AMD's Puma platform, the theoretical performance of the machine also sits above the Netbooks and with standard usage should be clearly less restricting in this regard. Find out what kind of impression the little Puma made on us in the following comprehensive review. 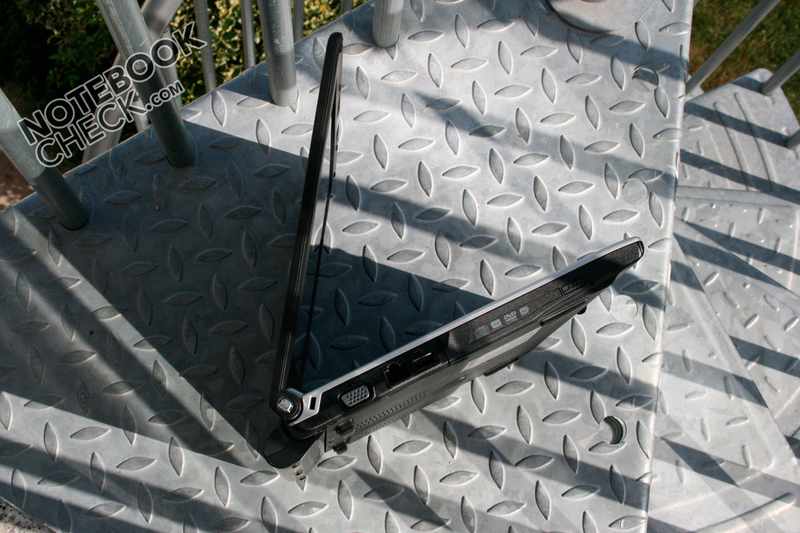 With its current price of 700-780 Euro, the PR211 positions itself right above the most expensive 10" Netbooks. 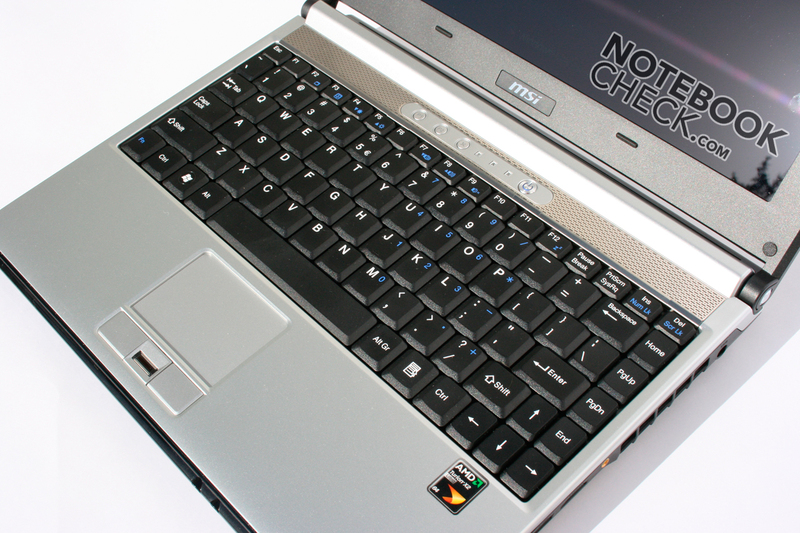 With the added price comes a quicker CPU, a more powerful graphics card, 2" more screen space, a large hard drive and and an integrated DVD burner. 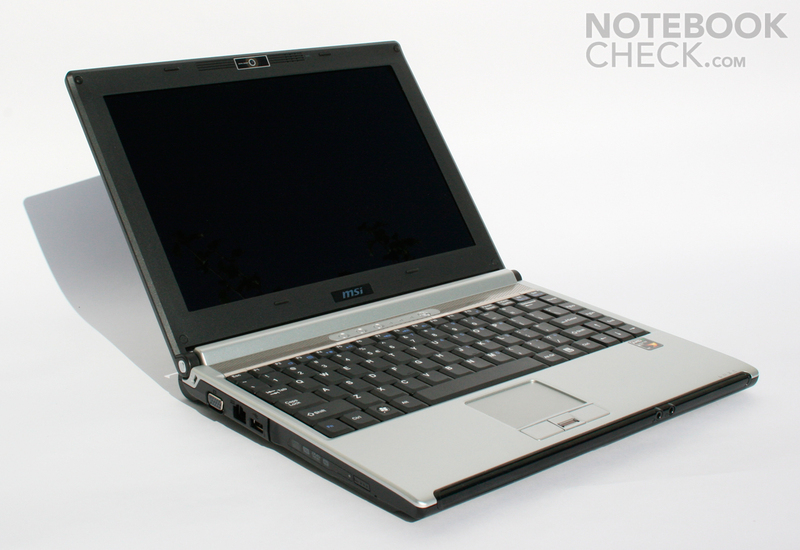 On a less positive note, this subnotebook, at 1.85 - 2.05 kg (depending on configuration) also weighs considerably more. 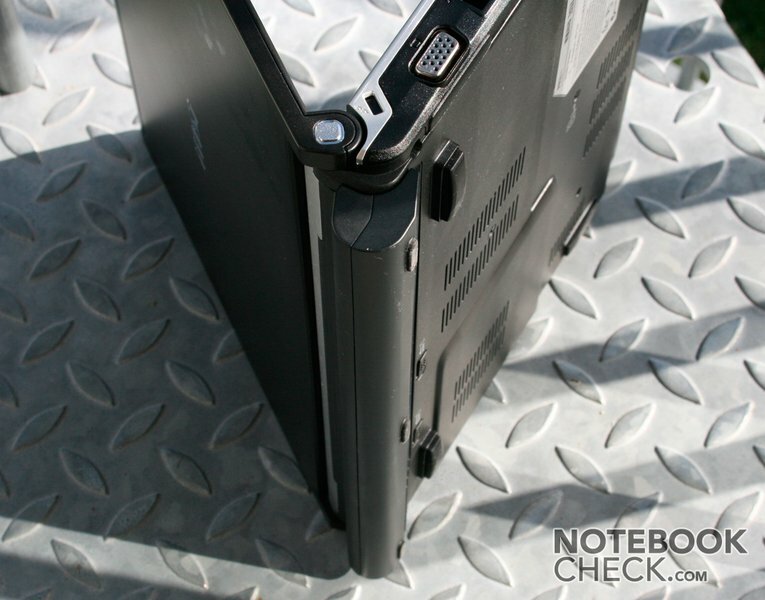 The Megabook PR211 from the "Professionals" series from MSI pleases with its simple image. The very stable plastic / magnesium combo of the case provides sturdiness and keeps creaking noises at bay. The tactile aspect of the case is however only partly convincing. 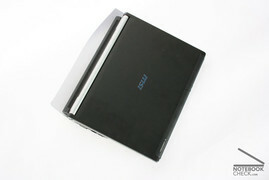 The display lid finished in magnesium alloy leaves a very high quality impression. The rest of the casing however leaves the user somewhat disappointed, having quite a "plastic-y" feel. The ornamental-looking hinges are also highly noticeable, which still manage to keep the display in the desired position without perceptible rocking. 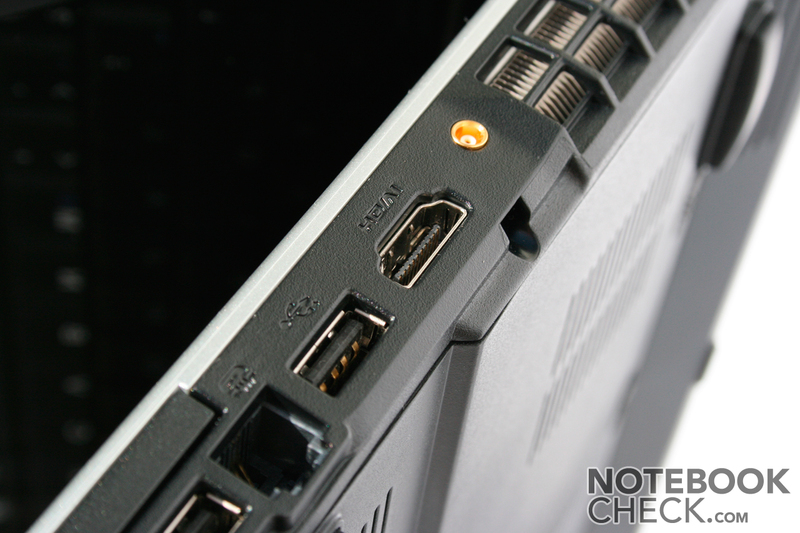 MSI has done without a closing latch for the display on the PR211. This is compensated for by magnets which clamp the display to the baseunit, made obvious by an audible clicking when closing the notebook. 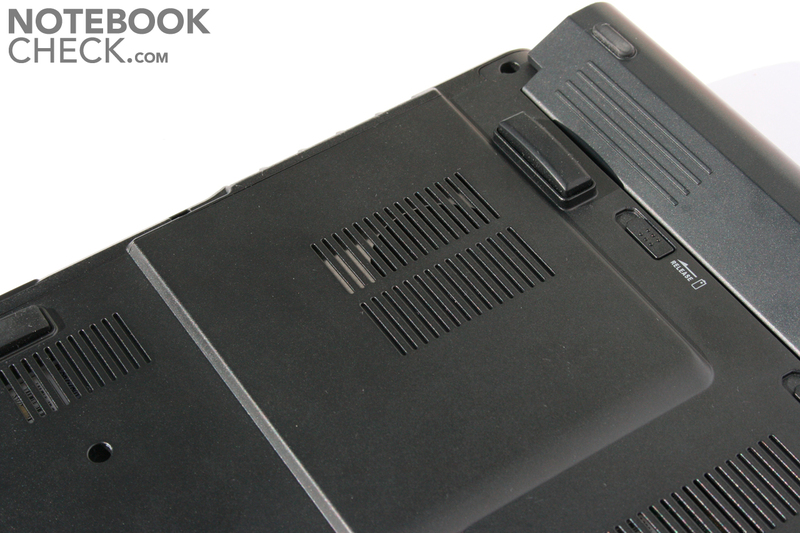 The only major positive for the Megabook PR211 in terms of connections is its integrated HDMI Port which enables the digital transmission of audio and video data to compatible peripherals. This is particularly important since signal quality provided by the integrated VGA output was quite poor. In the subnotebook's promotional materials, an emphasis is placed on its integrated AI array microphone. In our test however, voice recording was not handled particularly well. Using the audio recorder in Vista, the mic only came through very quietly. Boosting the input level helped, but also made the signal noticeably noisier. 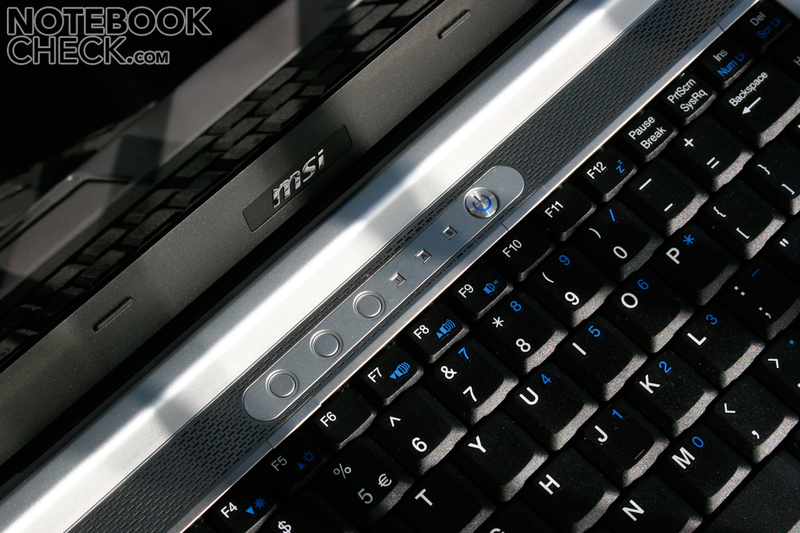 The MSI Megabook PR211's keyboard proved itself as a good mobile input solution. 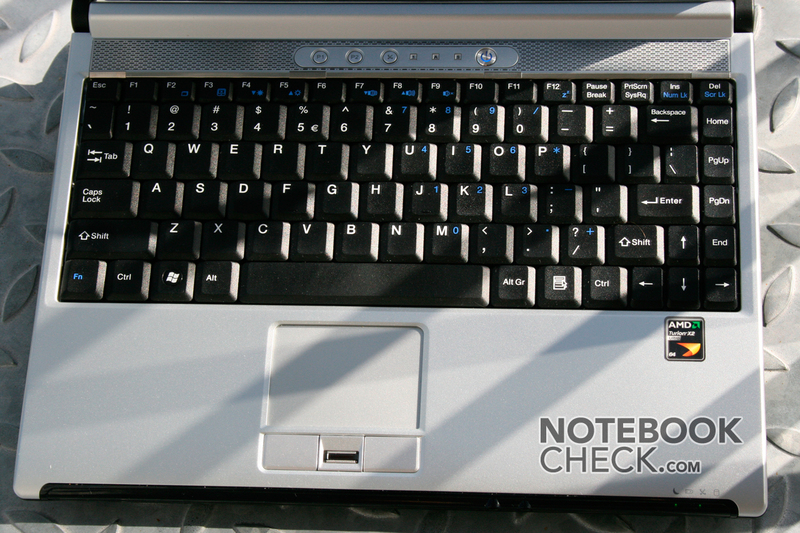 The notebook's individual keys are normal to large in size (besides the smaller special keys around the Enter key) and offer an easily perceptible pressure point, accompanied by only a light clicking. Our test device came with a foreign keyboard which made passing accurate judgement on the layout itself difficult. Nevertheless, 10 finger touch typing seemed completely unproblematic. Above the keyboard, next to the power button, MSI has placed three special function keys which unfortunately are not user assignable. 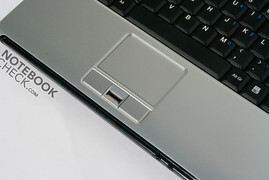 The small notebook's integrated touchpad displayed good gliding properties. There was however no horizontal or vertical scroll area (nor were such areas configurable in the driver software). 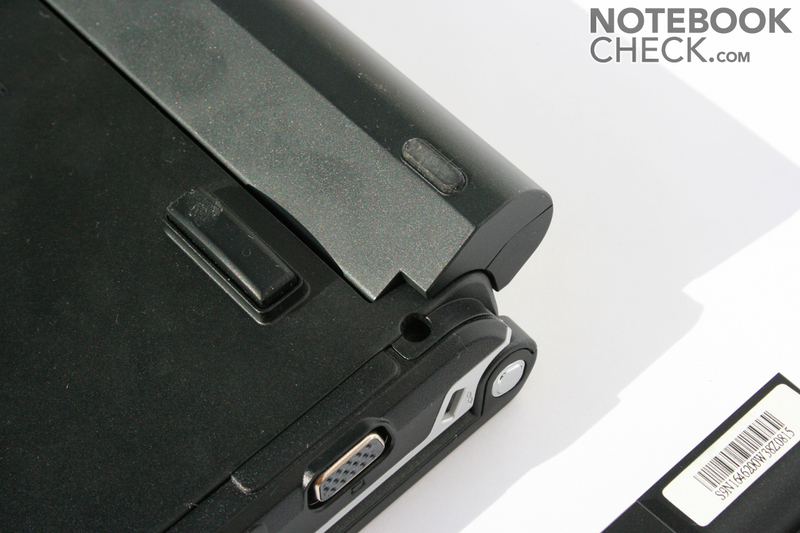 Two relatively small touchpad buttons find themselves beneath the pad. Compared to other touchpad setups, these buttons were relatively difficult to use, however did not pose any great problems. The integrated fingerprint reader also finds itself in between the small buttons. Using the provided software, this can also be configured for scrolling purposes. In practice however this functioned only relatively poorly. The sensor itself was able to authenticate us 90% of the time (the remaining 10% probably being caused by the finger travelling too quickly over the reader) and proved itself to be a practical authentification tool. Nevertheless, the system's security should not be blindly placed in the hands of the fingerprint reader, since such devices can generally be quite easily circumvented. 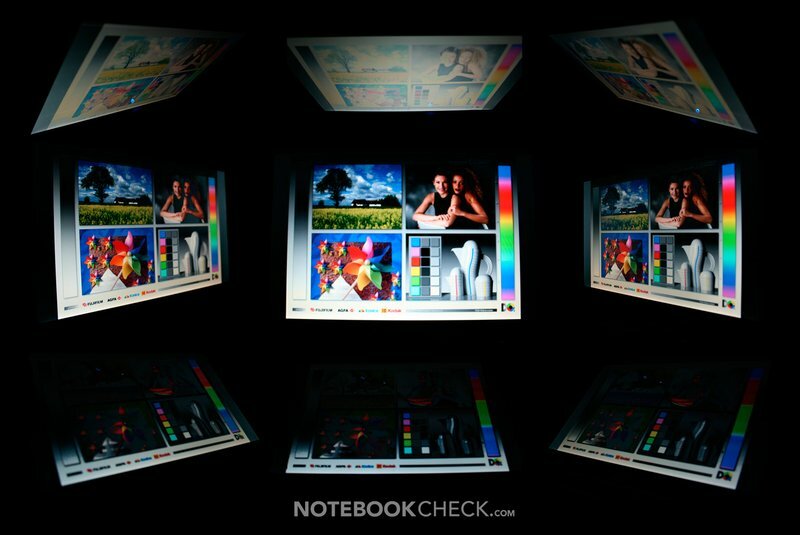 The reflective 12" widescreen display, due to its maximum brightness of 170 cd/m², was unfortunately only suitable for indoor use. The harsh reflections seen outdoors strongly inhibit any long sessions in such an environment. Even indoors it would help to reduce light sources behind the user. A business notebook should really come with a matte panel and prioritise on maximum comfort over long periods of use. At just 71%, the panel's illumination was not hugely impressive either. On a black screen, a bright strip could also be seen at the bottom of the panel, meaning the backlight was shining through. The contrast of 200:1 was rather average. Nevertheless, the accuracy of colour presented by our test system were quite pleasing. Interestingly however certain shades of grey came out blotched, even though the panel otherwise handled the presentation of a grey gradient without noticable transition points. The small 12" display wasn't that convincing in terms of viewing angles either. As usual for the provided notebook-TN panel, the contrast changes very rapidly depending in vertical viewing angle. Colours however remain sufficiently stable. One special feature of the MSI Megabook PR211 is the AMD Puma platform used (chipset, graphics, processor). Despite the slow processor in our test machine (1.9 GHz Athlon X2 QL-60) and just 1GB of RAM, Windows Vista ran amazingly smoothly without any long waiting times (at least without those that wouldn't have also surfaced on other equpiment). 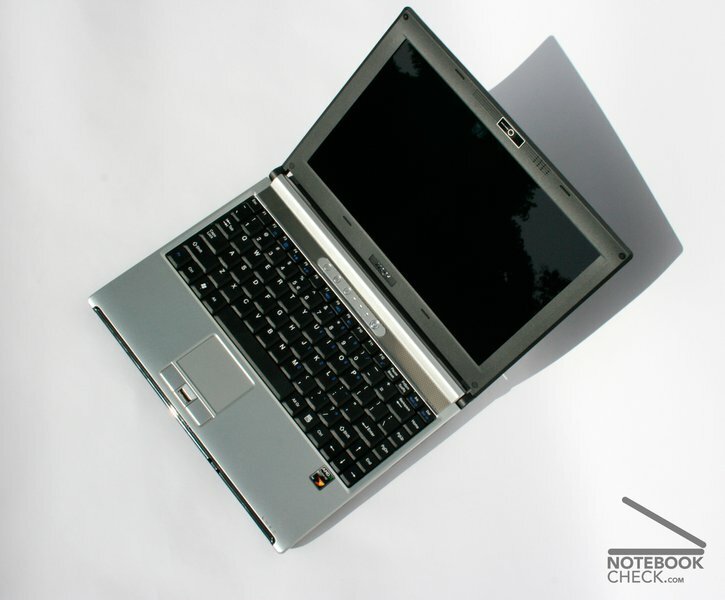 Office, web surfing, watching HD videos and all other daily tasks were completed by the MSI without problems. The dual core AMD Athlon X2 QL-60 with a maximum clock speed of 1.9GHz is based on the Griffin core of the Puma platform. Compared to the Turion X2, the Athlon X2 is quite slimmed down. It offers only two rather than three P-States (possible clockspeed states to save power) and the minimum P-State, at 950MHz is also considerably higher than the Turion's 500MHz. The C4 Deep Sleep energy saving mode has also been done away with. These economisations make themselves visible in the notebook's somewhat higher energy use when idle. The HyperTransport link is also different. For the Athlon, this link is clocked at only 3.6GHz (Turion 4.0GHz), and does not support power saving functions (known as Dynamic HyperTransport link). Finally, the RAM clock speed has been limited to DDR2-667 (integrated into the processor in AMD CPUs). Interestingly, the Athlon does offer the "AMD Virtualization" feature (AMD-V / Codename Pacifica). 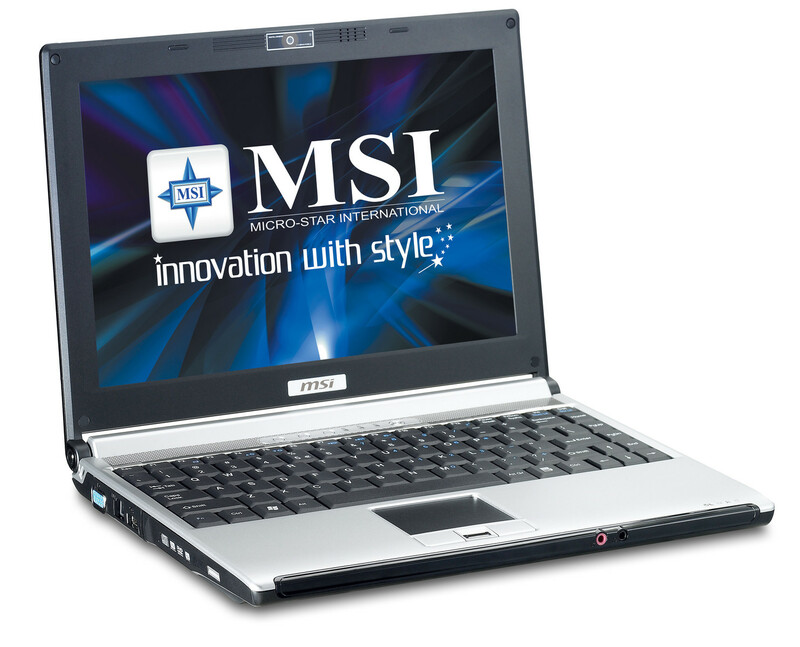 In the MSI Megabook PR211, the QL-60 displayed comparable performance to a machine eqipped with a Pentium Dual-Core (Core Duo) of around 1.6-1.8GHz. The machine's full performance was also available in battery mode. The core of the integrated AMD ATI Radeon HD 3200 Graphics Card works entirely off shared system memory and is based on the ATI Mobility Radeon HD 2400. For that reason, the card supports DirectX 10 and also includes an integrated video processor which assists the CPU in decoding HD Videos. We found that CPU usage while displaying full HD Videos ranged from between 50% (watching Clone Wars Trailer 2 in Quicktime) and 70% (WMV HD 1080p Coral Reef Adventure Showcase), with the picture remaining smooth. Other comparable notebooks currently available cannot achieve this. Gaming performance, due to the missing dedicated video memory, was poorer than that of the HD 2400. In other words, demanding modern games run either only on minimal detail settings or very unsmoothly. 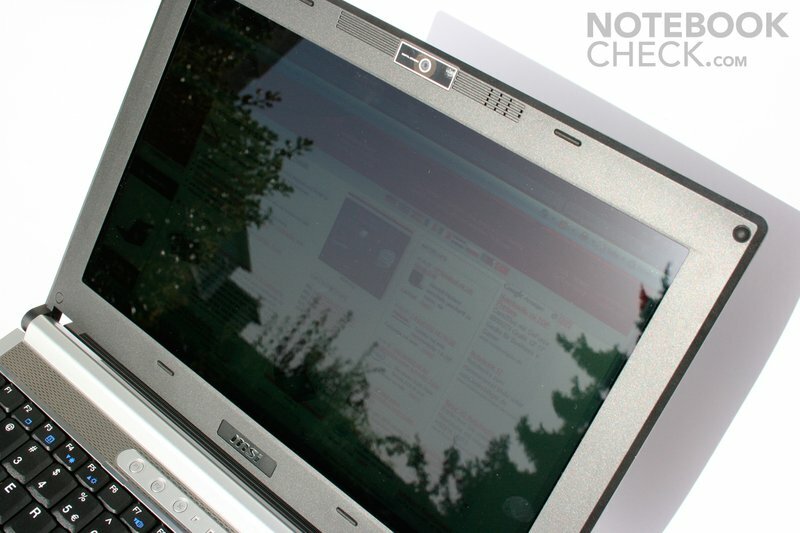 In comparison to older integrated graphics chips, the HD 3200's performance was quite convincing. For example, games like Doom 3, Fifa 2009 Demo, and even Call of Duty 4 ran smoothly on minimum detail and resolution settings. A borderline case was Race Driver Grid however. On minimum detail settings at 640x480 resolution, the BMW 320i's track ran relatively lag free with still quite picturesque graphics. On the other hand the city track constantly jittered and was essentially unplayable. Unfortunately the detail levels could not be lowered any further to attain a playable setting. Supreme Commander was also limited to a jittery 5-15 frames per second. Larger maps with multiple enemies were not playable at all. The Western Digital hard disk drive (WD2500BEVS) offered a generous 250GB. With a maximum read/write rate of 55 MB/s, its performance was however rather average. Overall, the component combination produced performance results that were nothing amazing, yet nevertheless quite sufficient. The Puma platform in the MSI PR211 really sets the laptop apart from its closest competitors, and increases its range of use. For undemanding customers, the performance provided would pose no issues for any application. At time of writing in the European market, only the more powerful 2.1GHz Turion X2 Ultra version with 2GB RAM was available. This shows somewhat improved performance overall (approximately 15% better 3D Mark 06 result). In our testing we unfortunately had constant issues with the Ralink 1T2R Mini WLAN Card. 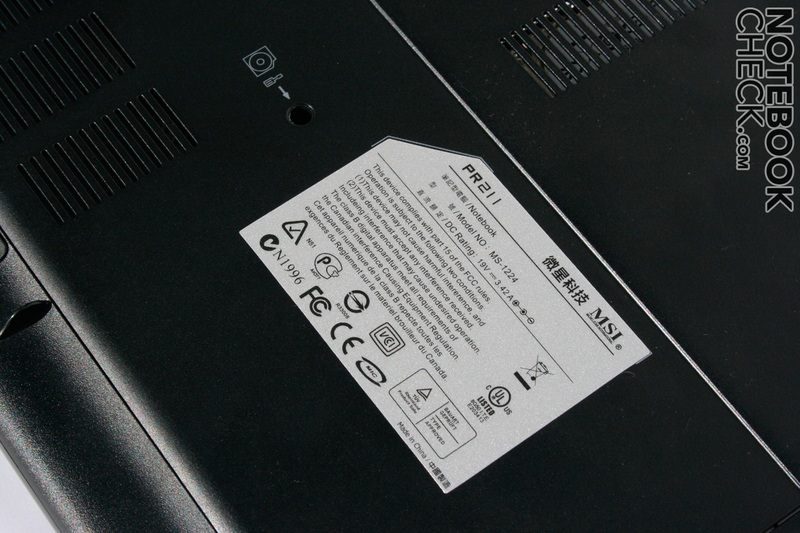 The connection to our Trendnet TEW-633GR Draft-n-Router was riddled with lag during LAN gaming and by the end of our review we were no longer able to connect with the router at all. Similar horror stories are rife online, with the issues being supposedly repairable via a driver update. Due to time constraints we were unfortunately unable to verify this. The fan noises are easily the biggest negative of this little notebook. Even while idling the MSI constantly, and relatively loudly, blew the warm air out of the case. In addition, in quiet environments, an uncomfortable high frequency humming could be heard. For an office notebook this was quite intrusive. Under load the fan spun one step faster, however the noise level was comparatively not as noticeable since most of the time any such emissions were drowned out by gaming noise. Given the constant running of the fan, the notebook's surface temperatures remained in the green zone at all times. Only after long periods of full load did the surface become warm, but never hot. (-) The average temperature of the palmrest area of similar devices was 28.6 °C / 83.5 F (-4 °C / -7.2 F). The stereo loudspeakers, situated above the keyboard, generally produced sound that was sufficiently loud and clear, although more could often be desired for video playback. Due to their small size the speakers often lacked bass however for a bit of undemanding background noise they were sufficient nevertheless. 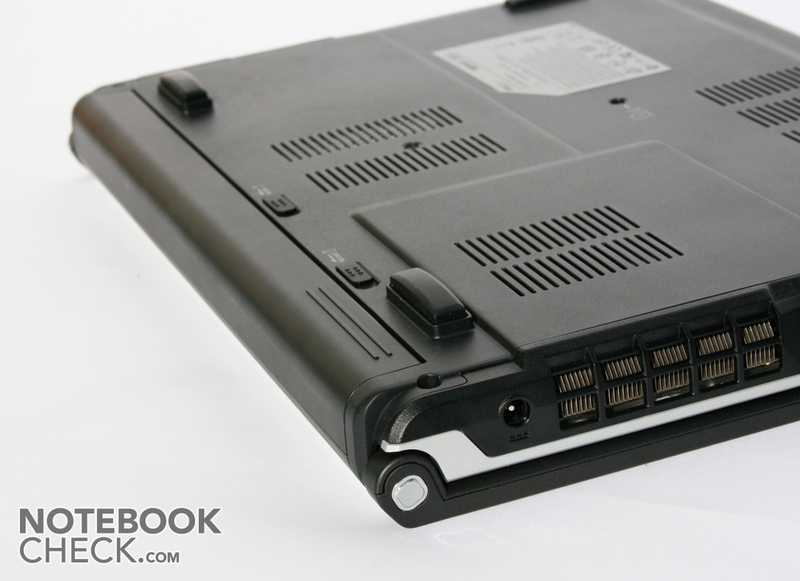 The small battery sits flush to the chassis. 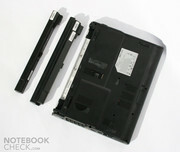 MSI provides the Megabook PR211 with two different sized batteries. The flush fitting small 38.5 Wh lithium ion battery offered 1h 55m of runtime when not under load. Under full load however this figure was reduced to just 46 minutes. With normal application, a battery life of around 1 - 1.5 hours could be expected. 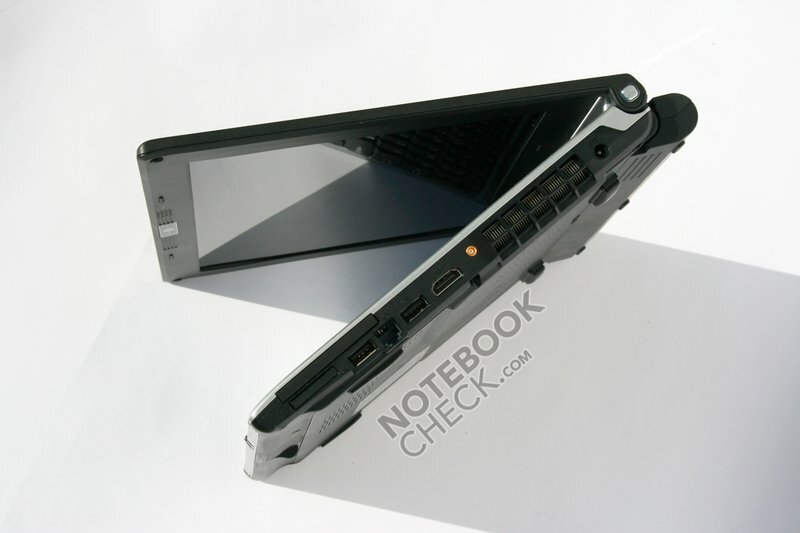 MSI also provides the PR211 with an additional battery that juts out slightly at the front bottom of the notebook. This battery, rated at 75 Wh, delivers obviously more power with a maximum runtime of 4h 40minutes. On average a runtime of 2.5 hours can be anticipated. 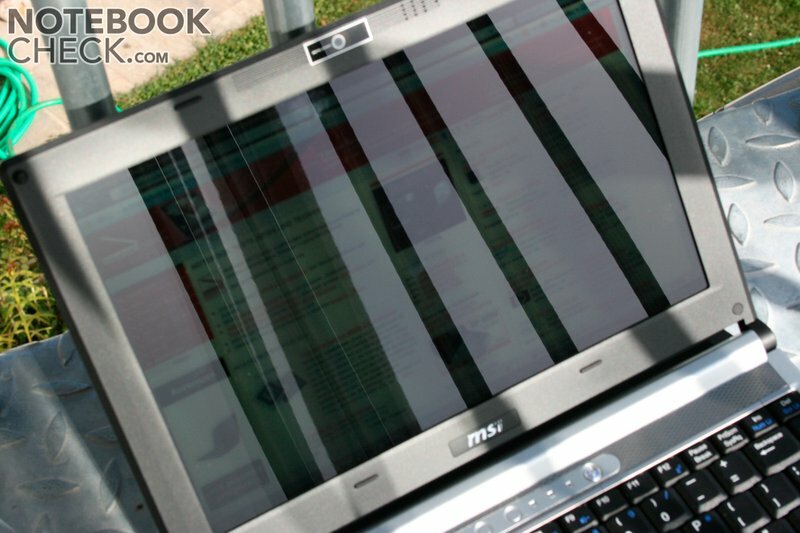 Here, compared to cheaper and weaker notebooks, the MSI Megabook PR211 failed to impress. 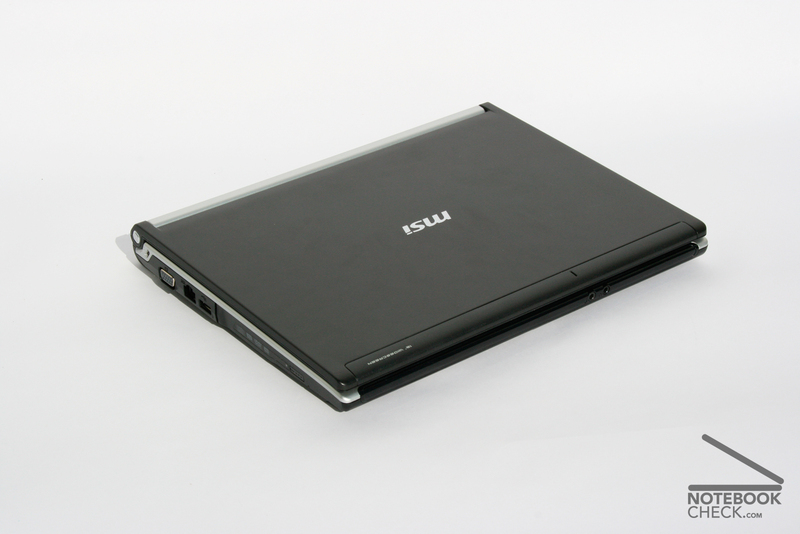 On average the MSI PR211 used more than twice the amount of power than, for example, the Asus Eee PC 901. The MSI Megabook PR211 is a good value subnotebook based upon the new AMD Puma platform. 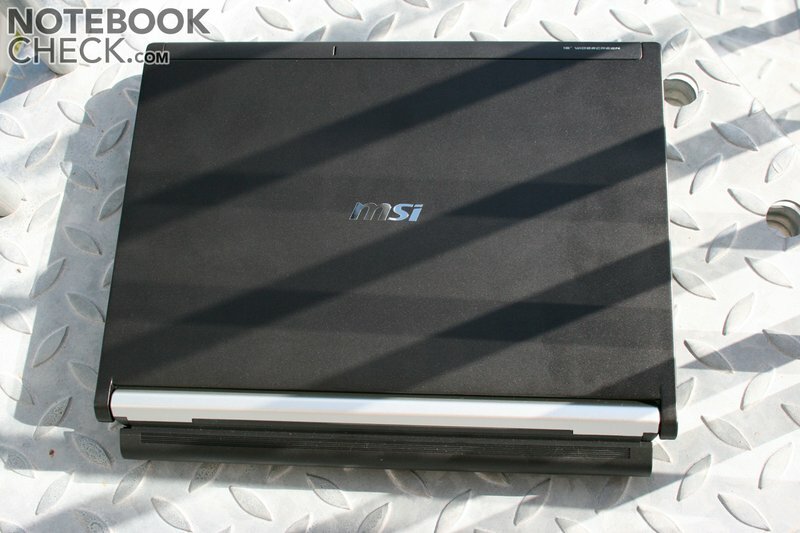 Price-wise the MSI positions itself above the most expensive Netbooks, however offers considerably more as well. 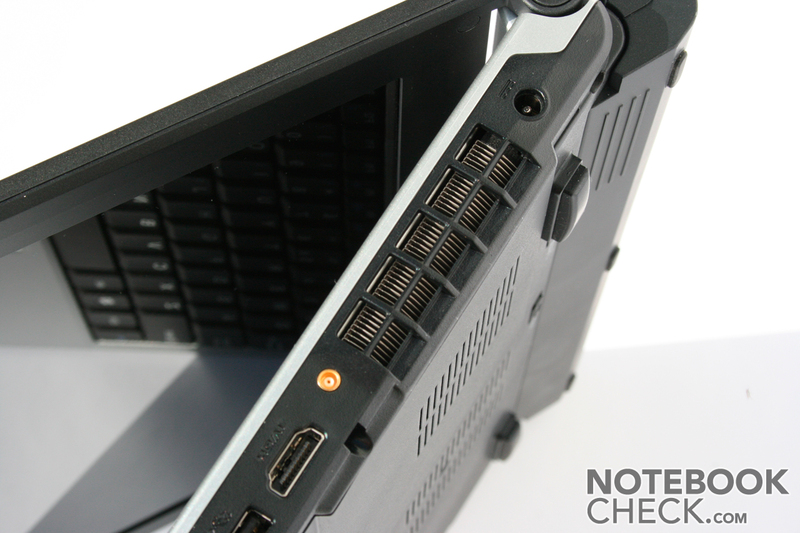 DVD burner, larger monitor, HDMI output, and distinctly better performance are obvious plus points. The Athlon X2 obviously won't turn any heads when compared to modern Core 2 Duo processors, however joins the performance ranks of the budget Pentium Dual Core chips, providing entirely sufficient performance for all day-to-day tasks. The relatively quick graphics chip is particularly noteworthy. That said, due to the slower Athlon X2 and just 1GB of RAM, the system's graphic performance trails somewhat behind the expected synthetic benchmark results. Less positive mentions include the constant and relatively loud fan noise. In quiet environments, an annoying high frequency humming can also be heard. The strongly reflective display and the (for us) somewhat uncooperative WLAN card also restricted possibilities for mobile use. Nevertheless, performance on most tasks was sufficient. The fan noise is one of the biggest cons of the MSI PR211. A high frequency humming originating somewhere other than the fan was also annoying. The upside is that temperatures remain in the green. The battery life depends on which of the two batteries provided is in use. Though the larger battery juts out at the bottom rear, it enables running times of over 4h. The loudspeakers are acceptable given their size. 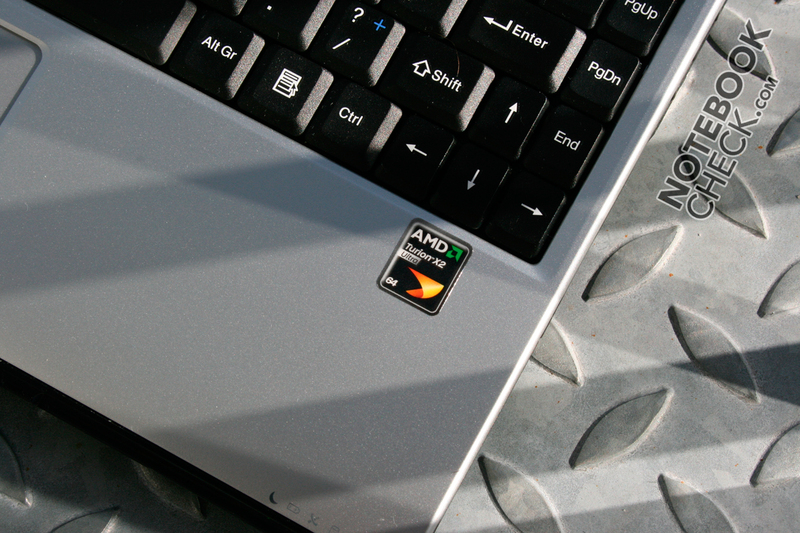 Despite the Turion badge, our test sample was fitted with a weak Athlon X2. 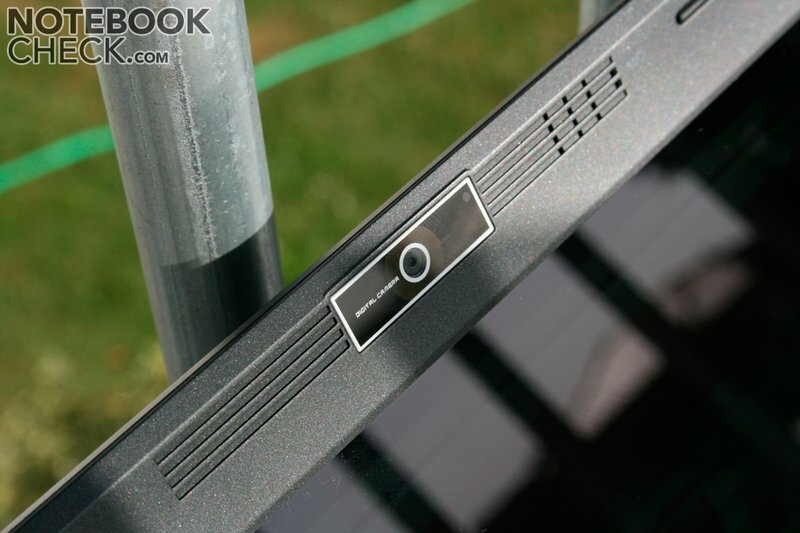 The 12" widescreen display is too dark and too reflective for outdoor use. ... based upon the new AMD Puma platform. The ornamental hinge is interesting. 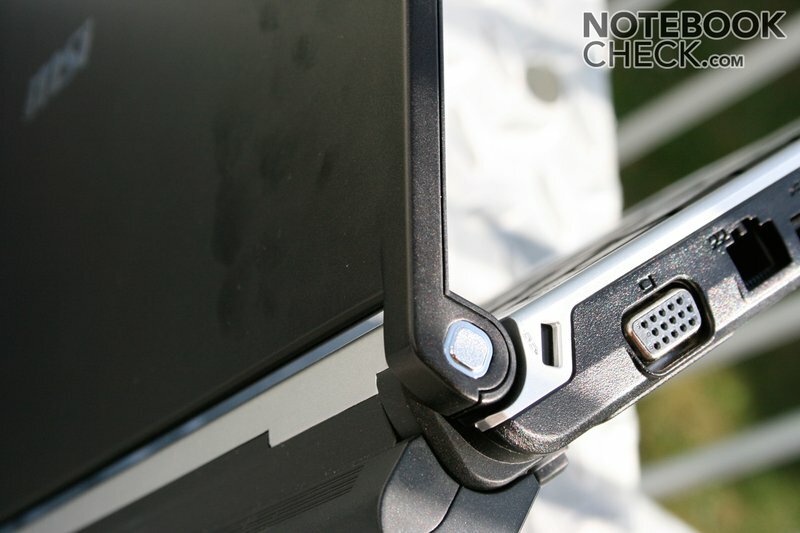 The only real eye opener in terms of peripheral connections is the HDMI port. A microphone and webcam are integrated for videotelephony. The input devices are solid with certain exceptions (rattling, missing scroll functions). 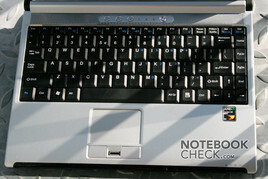 The quickstart list above the keyboard is not user modifiable. even the most expensive Netbooks, while covering an even wider range of uses.